We were able to get within feet of puffin colonies at Borgarfjörður Eystri and Látrabjarg, Iceland. 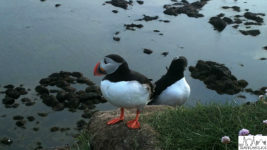 The audio was removed since it was so windy and the puffins really were not making any sounds aside from the occasional flutter of their wings. Don’t worry, we didn’t eat them.